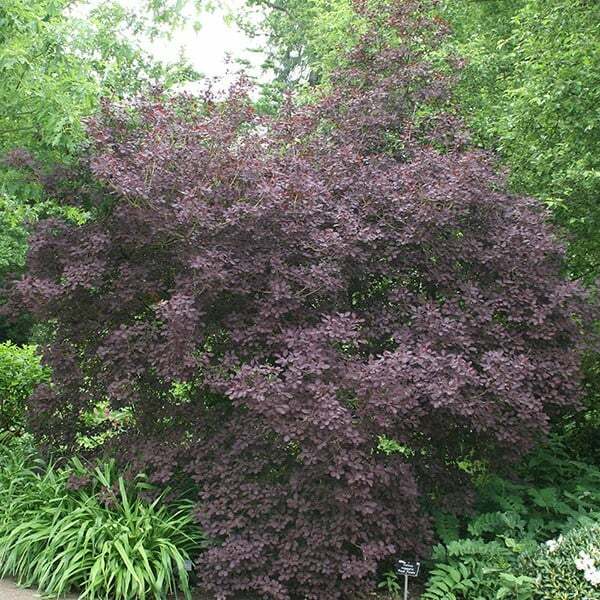 This deciduous shrub has magnificent, dark red-purple oval leaves, that turn scarlet in autumn. In July and August, it is festooned with fluffy plumes of purplish-pink flowers that look like a haze of smoke. This is an eye-catchin atching specimen plant for a sunny shrub or mixed border. The foliage, which appears almost translucent when backlit by the sun, is at its best when the plant has been pruned hard in March. Garden care: In late winter or early spring remove any misplaced, diseased or crossing branches. Alternatively, to produce larger leaves, cut the stems back hard to within two or three buds of the base in early spring. After pruning apply a generous 5-7cm (2-3in) mulch of well-rotted garden compost or manure around the base of the plant. A beautiful addition to a cottage garden. Wonderful colour and a great backdrop to perennials. Hi Crocus. 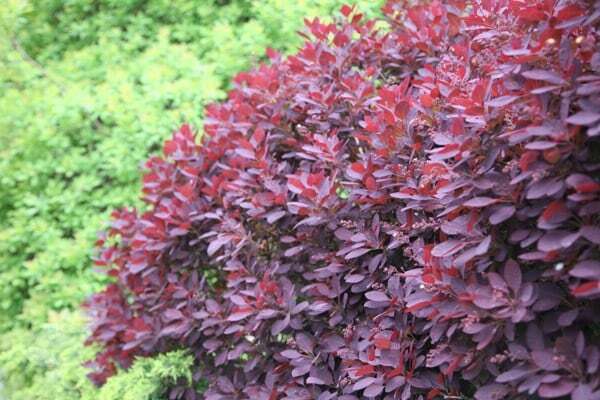 What time of year can I plant Cotinus Royal Purple? Hello, The best times to plant are either autumn or spring, however you can plant at any time of the year, provided the ground is not frozen in winter, or if planting in summer, you need to make sure it is kept really well watered. Hello, The leaves will hold their purple colour best when they are planted in full sun. It is quite normal then for the older leaves, which tend to be shaded by the newer growth, to lose some of their colour. Hello Crocus. We have 3 Cotinus coggygria 'royal purple' which are planted behind some macleaya cordata. They have been in situ for 3 years now, in a sunny border. However, they have hardly grown in height at all,being about 70cm at most, and cannot be seen when macleaya are fully grown. Should we water them more, feed, or maybe move them? Are the macleaya taking over?I am reluctant to prune as this will surely not help with height. Thankyou for any helpful suggestions. Hello, All plants compete for water, light and nutrients, so if the Cotinus are planted very close to other, well-established plants, then they will struggle a little. Also, I imagine that if they are tucked right at the back of the border, it may be easy to forget to water them, which will be even more important if they are near the base of a wall (as this is always very dry). The only thing you can do before you move them is to make sure they are kept well fed and watered during the warmer weather. If however they still don't flourish, then I would whip them out and move them to a better spot. Cotinus coggygria 'Royal Purple' hedge? Hi, Having seen a stunning display of the Cotinus planted with a band of Miscanthus sinensis 'Morning Light' in front of it, at the National Garden of Wales recently, I would like to try and reproduce the effect of the silver against the purple background. My problem however is space. I am in the process of providing a new bed which is approximately 6 feet long by 3 feet wide. Although you quote the Cotinus as growing to about 5m x 5m, you also suggest pruning it hard back to the base each year. If I prune annually as suggested, would it be possible to retain it to say a 1 - 1.5 m high bush, allowing the Miscanthus to be planted in front, thus forming a contrasting foil when viewed from both patio and lawn. If this is not considered viable, can you suggest another purple / dark red or similar bush that would provide a similar effect. Many thanks, Brian. Hello Louise, Cotinus can be cut back hard each year and this will encourage the plant to produce really large leaves, but this is usually at the expense of the flowers. If you want flowers, then you should resist cutting it back each year. I'm afraid you have been given bad advice as 'Smoke bushes' are fully hardy and don't need to be moved inside during cold nights. It is however a deciduous shrub so it will lose all its leaves in winter, so it is normal for it to look like a bare twig until the new leaves are produced in spring. Therefore I suspect it is still alive, and would recommend waiting until spring to see if it re-shoots. I think my 'Smoke bush' has died! I planted it the day I received it and have watered it regularly. Since we have had a number of frosts I have moved it into the garage on cold nights to prevent frost damage. I have done this on the advice of a professional gardener as it was a young plant and needed protection. Please can you let me know if you think it has died? Cotinus - puffs of smoke or lollipop leaves?